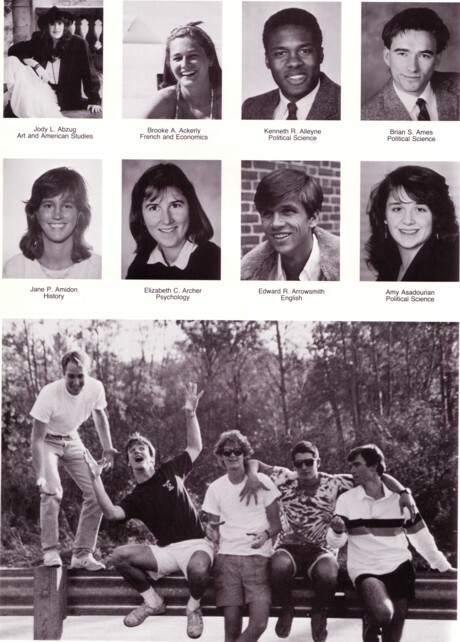 Since no one seems to have taken an interest in College Council elections (either present or 15 years ago), I think that I’ll go back to easier pictures. Here is the first in a series from the year book. Who can name all our intepid fence sitters and/or explain what they are doing? Jane Amidon graduated from Williams College and holds a masters degree in landscape archiecture from Harvard’s Graduate School of Design. She has been a studio associate with Kiley since 1993 and has worked extensively to document his works and words. the book is a compelling and beautifully written discussion on contemporary landscape design. A book about any other field of design would probably not include the rather self-conscious word “radical” in the title, but its use here is indicative of the generally reactionary nature of most open space design… there are a few valient souls out there trying to change this state of affairs, and this book chronicles some of the best…Amidon writes, ‘Among the creators of radical landscapes it is difficult to find common threads,’ but her strategy is broadly successful in organizing this diverse selection of landscape designers and their work. I wish that I could describe my profession with such an eloquent one-liner. Anyone with better information about Jane should pass it along. EphBlog is powered by WordPress and delivered to you in 0.753 seconds using 36 queries..